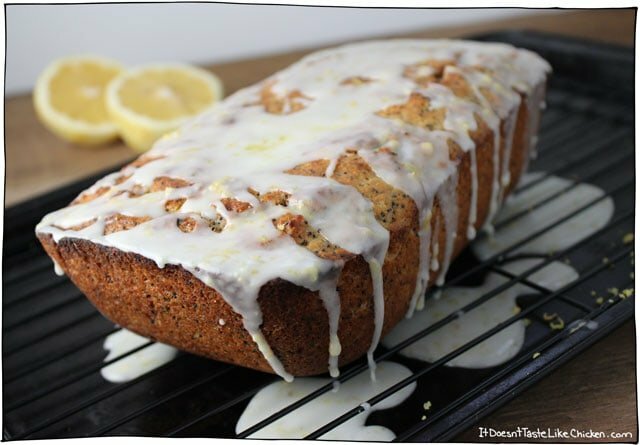 Drizzled with lemon icing – pretend it’s part of a complete breakfast because it goes so damn well with coffee – Vegan Lemon Poppy Seed Loaf, I love you. This is a glorious morning treat. If you want to feel like your house has been magically turned into that really cute little coffee shop down the street, this is the recipe you need to make. (Indie music not included). 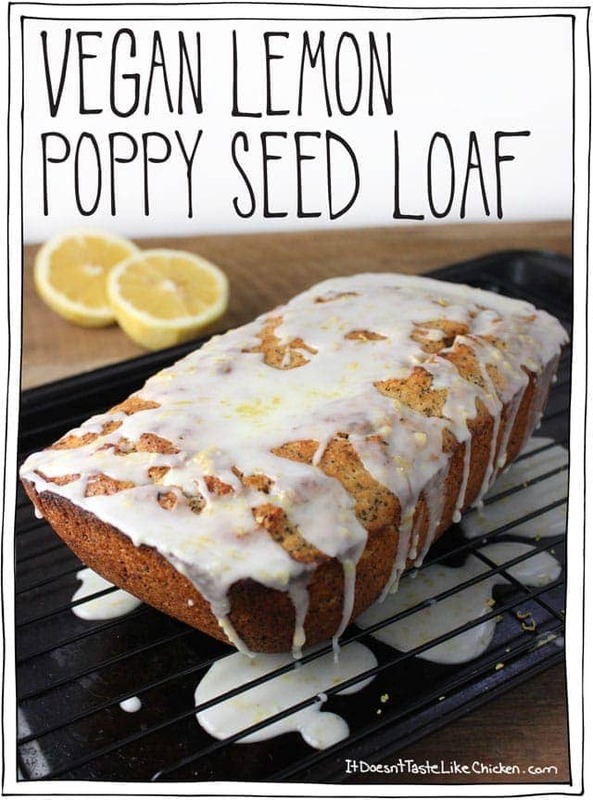 I love this soft, buttery, fluffy, lemony, poppy seedy loaf. It makes a mornings go from cold cereal boring, to a special spring way to start the day. My recipe isn’t quite as yellow as some of the lemon loaves you see out there, but that’s because I didn’t use any food colouring, and I opted to use whole wheat flour to get a little nutrition squished in there. Personally, I think it looks gorgeous and I tell it that all the time. I don’t judge by the colour of your loaf. So here we go, mix all the dry ingredients in a large bowl. You can opt for less poppy seeds if you like, but I LOVE the flavour of poppy seeds, so I wasn’t shy. Mix the wet ingredients in a medium bowl. Don’t forget to zest your lemons before juicing them, because then you may run into some serious zesting issues. Mix wet into dry until just combined. No need to beat this to death, and kill all those lovely rising bubbles. Pour into a lightly greased loaf pan. A metal one will work fine too, and bake. Let your loaf cool completely before icing. Then just drizzle the icing all over, in any zig-zagy way you like. It always seems to look pretty no matter how messy you are. Let the icing set, stand back, cross your arms, nod, and be impressed at your gorgeous baked treat. I love this soft, buttery, fluffy, lemony, poppy seed loaf. It makes mornings go from cold cereal boring to a special spring way to start the day. The lemon icing kicks it up even more for a real breakfast treat. Preheat your oven to 375F (190 C). Lightly grease a loaf pan. 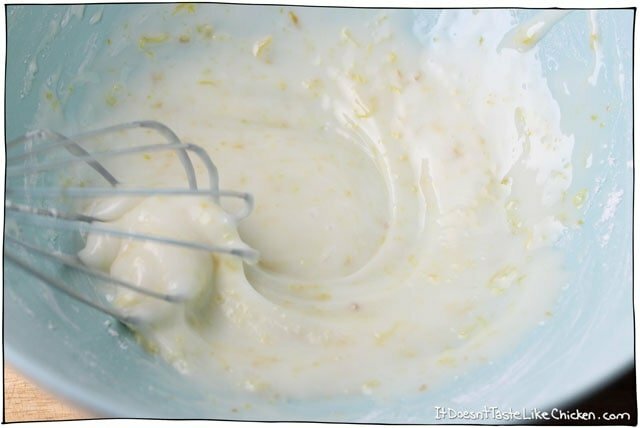 In a medium bowl whisk together the wet ingredients. Pour the wet ingredients into the dry and gently mix together. Don't over mix, lumps are totally fine. Pout the batter into at the prepared loaf pan and bake for 45 - 55 mins, rotating once midway through. The loaf is ready when a toothpick inserted into the center comes out clean. Let cool completely before icing. 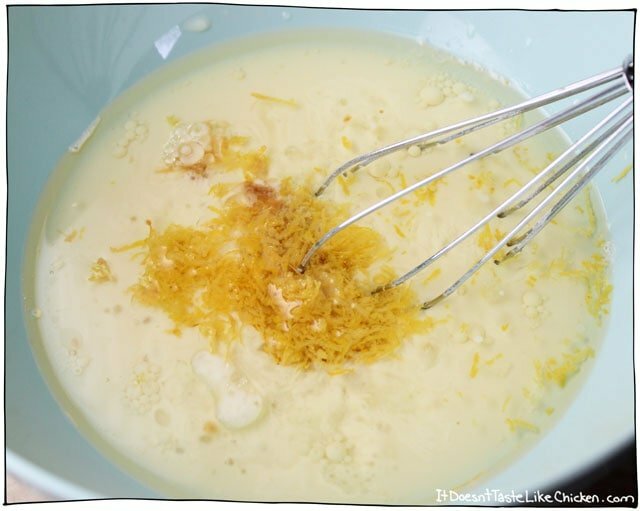 When cool, mix the lemon icing ingredients together in a bowl. Set the loaf on a cooling rack over a baking sheet to catch all the excess icing. Drizzle the icing over the loaf. Let the icing set for about 30 minutes before slicing. 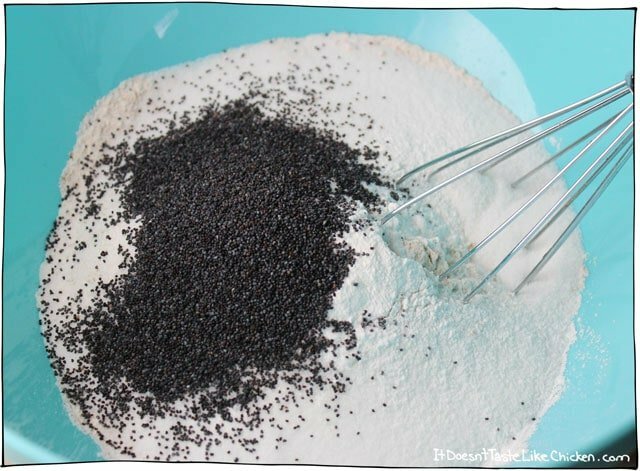 Featured Ingredient: Poppy Seeds. 76 Days, 45 Recipes to go! This turned out PERFECT! I was looking for a simple vegan lemon poppyseed cake/cupcake recipe that didn’t call for a ton of ingredients and wasn’t gluten free. Came across yours and it turned out amazing. I made them into cupcakes and topped them with a vegan lemon cream cheese glaze. Thanks! I’m planning to make this. What size loaf pan did you use? Thanks. My loaf pan is 8″ x 4″ but a 9″ x 5″ would also work, it would just be a bit shorter of a loaf. Enjoy! This is excellent, exactly what I was hoping for! I would just suggest that no one try to use turmeric to make it more yellow. I added less than a quarter of a pinch and the taste is too much for the delicate lemon flavor. Hey, can I make muffins instead of cake? How long should I bake it in the oven than? Sure! I’m not sure the specific baking time as I haven’t tried it myself. They will take less time to bake, so keep an eye on them and test with a toothpick for doneness. This cake was out of this world. I used Avocado oil and i figured half a cup for a whole cake is not bad. I have a recipe from Green Planet and it is too oily. Your cake is amazing, as good as the Pumpkin cake recipe I made from your collection for my husband’s B-Day. 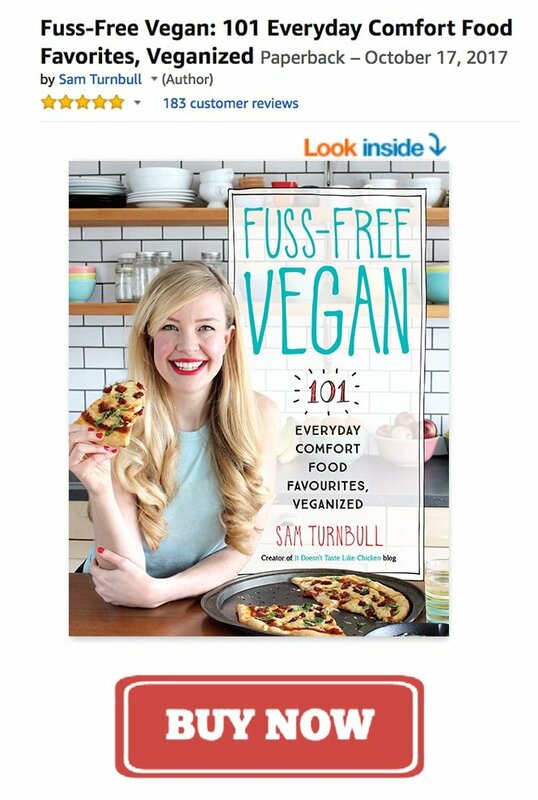 It is easier and takes no time….thank you so much another addition to my collection of Vegan desserts, compassionate and delicious. Made this for the first time today,came out great, delicious and moist,with a lovely icing. Even my son loved it, and he doesn’t eat cake often, he had seconds. Thanks Sam. Could these be frozen and kept post bake? Yes it should freeze well. Enjoy! THE CAKE WAS ABSOLUTELY AMAZING..and yes I used Avocado oil, Oil is good for you in moderation I am so sorry but I have a long comment…..I’ve been a Vegan for almost 17 years before all these fad and I do not know who invented the stupid idea of grouping Vegan food into people who eat only process food , mock meats and cheeses. That is completely inaccurate and bogus. “Veganism is a way of living which seeks to exclude, as far as is possible and practicable, all forms of exploitation of, and cruelty to, animals for food, clothing or any other purpos”. so is someone finds easier to eat once in a while store bought plant based cheeses or meats such as Beyond meat etc..it is OK AS LONG AS you do not eat animals and balance your diet with lots and lots of fruits, veggies and grains. The purist notion that one is healthier than the other one focuses on probably those who are used to the typical american diet full of gross burgers and processed store bought food and then they turn to plant based but under the same notion. THOSE PEOPLE DO REPRESENT all vegans and the notion of Veganism, I cook EVERYDAY and I can say that I mix it up, sometimes yes I buy plant based cheeses and other times I make my own ,like mozzarella or ricotta with almonds etc… I am size 4 and my last blood work along with my husband’s were perfect…it so stupid to start with acronyms such as WFPB to group vegans that do not know how to balance their food with those who are vegans and are more knowledgeable about nutrition…it takes away all the good that involves to become a Vegan..
Wow, just wow Beatriz! Thanks for letting me know that your cake was amazing, and glad you enjoyed it, too. Sam, keep up the great work you’re doing on IDTLC! I promised my wife that next time I make this I will make the icing too. I just couldnt wait for it to cool. It smelled so good. Thanks again for another quick and easy recipe. I wondered why the mixture was so runny and I needed to add more flour. It wasn’t! I had forgotten the sugar… still delicious with just a little honey drizzled on it. The lemon smell is great but I’m doubling the amount next time. The cake is cooking ! Thank you for your recipe ! Wonderful, you’re welcome and enjoy! Not able to go out and buy stuff so trying to make substitutions with what I have. If I use earth balance soy free buttery sticks how many sticks should I use. If I use almond yogurt I steadof almond milk how many tablespoons. I wouldn’t use vegan butter sticks or yogurt as it will change the consistency of the batter quite a bit. If possible, stick to oil and non-dairy milk. Can you melt the sticks? I haven’t worked with this product but just looking at the ingredients list you should be able to. You should be able to just use water. If you want to use that almond yogurt you could always try 1/3 yogurt and 2/3 water. 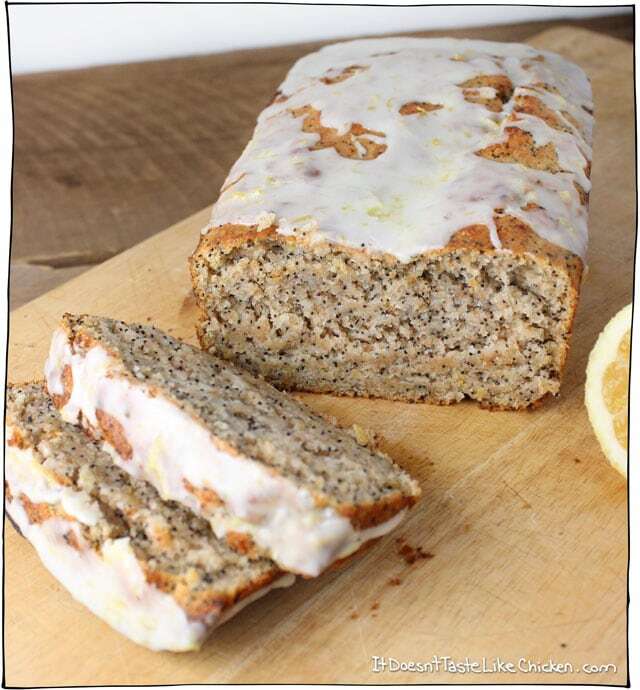 Well, when life gives you lemons, make this delicious lemon poppy seed loaf! I made this for breakfast this morning….So worth the wait! I haven’t made this recipe yet but would like to. Can I substitute coconut oil for the canola or vegetable oil? And if so, the same measurement? Hi Sada, yes you can, but coconut oil is solid at room temperature so it would make for a heavier cake. Enjoy! Easy recipe and delicious! It was a hit! I made your bread I was hungry for lemony flavor and I had a ton of lemons . It’s so good but I didn’t bake it for 40 minutes for 35 my oven is very hot and convection but I see that your bread looks crispier than me . I did the tooth pick test and it came out clean so I took it out . I think the texture is so awsome moist but should it be overly moist ? I always over bake bread because of my oven being very hot so I didn’t want to over bake it and I wasn’t sure if it was going to me a dry bread . But I think next time I will bake it longer . So my question is your bread very moist ? I love lemon so much next time I wil do 1cup almond milk and 1/4 plus the 1/3 lemon juice and I will buy lemon extract. Sam thanks for your website and your very bubbly fun to watch personality . Enjoy! Hopefully it turns out. 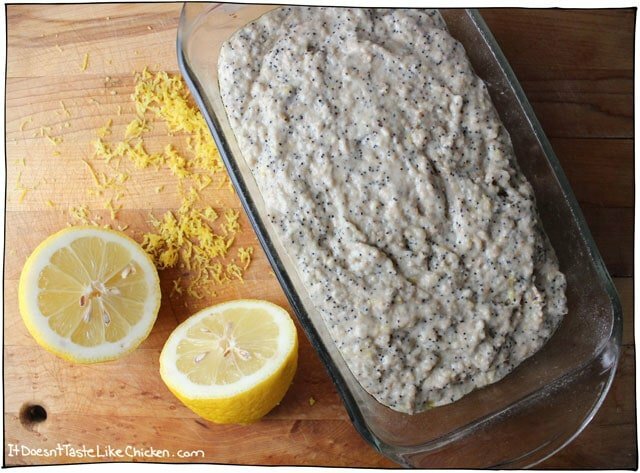 Just made your lemon poppy seed loaf and it is so delicious! Also, it came out looking very good, just like in your pictures, Thank you so much for sharing this great recipe. Love ❤️ this recipe !!! I make it for my daughter and must say it is the easiest recipe I’ve ever made !!!! Thank you so very much !!!! I made this with unbleached white flower and it was perfect. I used vanilla soy yogurt in place of the soy milk. I added 3/4 cup butter to the drizzle in order to make it a buttercream frosting. Absolutely delicious. Thank you! I am planning to make this recipe soon and I was wondering whether you think it’s possible to substitute the white sugar for maple syrup. Thanks! Hi Marjolein, I’ve never tried it myself so I can’t be sure, but you can try following the directions in this article. Enjoy! I am new to your blog and very excited to see all the recipes you have posted, and the hard work you put into testing every recipe. I wanted to bake this cake for Easter. Can I bake the cake the night before, and then add the icing the next day, or does the cake need to be slightly warm to have the icing adhere properly to the cake? Welcome, Susana, and thank you so much! Absolutely, you can totally bake the cake the day before. The cake should be completely cooled before icing so it will work just perfectly. Enjoy! 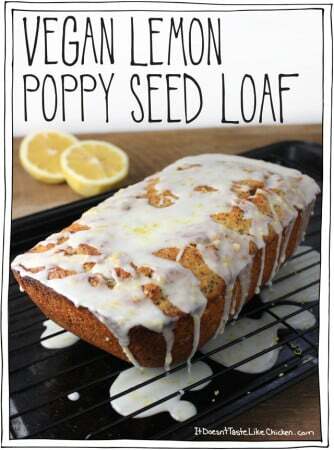 This looks delish; I came across it during my search for vegan lemon poppy seed loaf (to make as mini loaves). Hopefully it works out for me! A few questions for you: 1) Would whole wheat pastry flour work or did you design this recipe using regular WW? 2) Also, does it matter whether I use the boxed milk (sold on shelves) or the carton ones (sold from a refrigerated cooler)? 2b) Is there a general “rule” to help decide which to use for cooking or baking? I’m unfamiliar with non-dairy milk; I’m making this for a group that includes one vegan and I hope that the non-vegans enjoy it too. 3) I don’t use canola oil; would grapeseed or vegetable (e.g. Mazola) oil work? 4) I’d like to use this recipe for mini loaves – any guesses on how many this would yield? 4b) How much should I fill the pans? Thanks for this recipe – it’s a perfect spring and Easter-time flavor! Whole wheat pastry flour might be a little too soft and might not hold up properly. I would stick to regular whole wheat flour. The boxed milks or the ones in the fridge section are all great. Generally, any non-dairy milk works well, but the standard go-to’s are soy milk or almond milk (I generally prefer unsweetened soy). Vegetable or other light oil will work just fine. Here are some tips for baking mini loaves. The pans should be about 2/3 full. Enjoy! I hope it turns out perfectly! Success! I did them as muffins for the 16-17 mins as suggested by another commenter. They looked fabulous too. I got 13 perfect sized ones and one smaller one. I used parchment cupcake liners which came right off. I made them twice and plan to make again. Second time I used 1/2 c white sugar and 1/4 c coconut sugar. Next time I’ll reduce the sugar more. Lovely texture and flavour. Thanks! I just tried this recipe as muffins (sans icing) and they turned out great! Absolutely delicious. They made about 14 muffins, filled with 1/4 cup of batter each. I baked at 375 and had them in the oven for 16 minutes. The only issue I had was that they really liked to stick to to the cupcake liners that I used, resulting in some of the muffin being tragically lost. I’ll try greasing up the muffin pan with non-stick spray and flour next time–and there will definitely be a next time! Oh those sound fabulous! I always find silicon muffin liners or parchment paper muffin liners are the best when it comes to non-stick. Sometimes the cheap ones in the grocery store are just paper and are doomed for sticking! I just made this. Wonderful! i love that you used whole wheat. We grind our own. I did however, substitute apple sauce for the oil. My kids didn’t even notice. This recipe is amazing! I didn’t have poppy seeds and used chia seeds and it turned out perfectly! This loaf is so delicious – the fact that it’s whole wheat flour is unrecognizable! Hi Sam, ok so mmmmmmmm…making this today. One question, are the poppy seeds whole or ground? Thank you. Whole poppy seeds! (Otherwise you won’t see them in the loaf like in the picture). Enjoy! Could we use almond flour instead of wheat flour? Almond flour is simply ground up almonds, which mean it doesn’t have the same binding qualities as wheat flour. If you are looking for a gluten free option I recommend trying an all-purpose gluten free blend intended for baking. I know Bob’s Red Mill makes one. I hope that helps! Do you have to use whole wheat flour or can j use all-purpose? This recipe is designed for whole wheat flour, if you use all-purpose, you will have to experiment with ratios. Here is a good guide. I haven’t tried it myself though, so I can guarantee results. Do you think I could replace lemon and poppy seed with a berry and nut? For example strawberries and almonds? Also, would the temp be the same if I wanted to do lemon poppy seed muffins instead of a loaf? Great recipe and thanks! Hi! I am trying to get away from refined sugar – if I used honey, would it be the same amount or less? do you think I would beed to balance out the extra ‘wet’ ? I don’t cook with honey as it’s not vegan, so I am not really sure. If you are trying to cut refined sugar, I would try unrefined palm sugar which I have heard good things about. Hope that helps! I’m looking forward to trying this soon! I was a bit confused with the quantity of lemons. Are the 2-3 lemons also for the icing? Or should i buy 4? Thank you! It just depends on the lemon size, and how much juice you can get from them. You need 1/3 cup for the load, and 2 additional tablespoons for the icing. I find that lemons in my grocery store vary a lot in size, so I would always buy more just to be on the safe side. Then I use any leftovers for lemon water. I hope that helps! Hello! My husband and I absolutely LOVEEEE this recipe!!! Honestly, I’m making it 2-3 time a week. 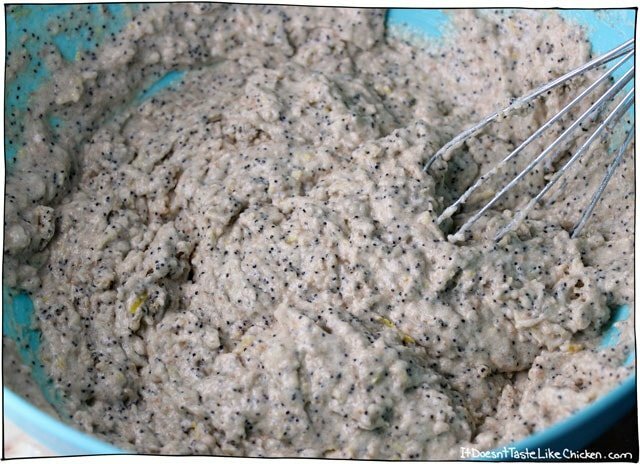 I use applesauce instead of the oil (we try not to use oil) and I don’t add in the poppy seeds or lemon zest just because I never seem to have them. Now that fall is coming I want to encorporate pumpkin into everything possible. Do you think I could take out the lemon and maybe the applesauce and add canned pumpkin and pumpkin pie spices? Thanks so much!!! For the pumpkin part of the question, I really have no idea! That would be so many changes that it would be difficult to know how it turns out. Hello! I had been super excited to bake this loaf as soon as I first saw you post it. I’m glad to say that it did not disappoint- in fact, the flavor was wonderful and it was just sweet enough. Each slice was a bit on the chewy side (is that a property of baking with almond milk? ), but I loved it. Thanks for this lovely recipe! Yay! The chewiness would likely come from the whole wheat flour. So happy you loved the recipe Felicity! Thank you for sharing this delicious vegan recipe. I noticed a typo that is a bit confusing. The second instruction should say “mix together all the dry ingredients” instead of “wet ingredients.” Have a great day! I made these into mini loaves and had them with fruit for dinner. I baked them for about 17 minutes. Fabulous, and even wowed my non-vegan family! Yay, so happy you and your family loved the recipe, and the mini loaves sound great! OMG!!!! Now I know for sure what I’m making for Sunday’s Easter brunch!!!! That’s a thing of beauty, Sam!!!! This would be a great Easter addition! From what I understand about coconut sugar it can be used as a direct replacement of white sugar. I haven’t tried it in this recipe myself but it should work out fine. Enjoy! I wasn’t able to make it for Easter, but I did just make it for Mother’s Day and it got rave reviews, everyone loved it! Thanks for sharing this recipe, it’s definitely a keeper (btw, I used regular sugar and not palm). I am so very happy you and your family enjoyed the recipe! You’re right, this would be a great Mother’s Day treat as well. I know my mom loves this recipe! Yum! This would be a great treat for company. Love lemon! I would put it in the muffin category, but I imagine they would work just fine. Just keep an eye on them in the oven as they will take less time to bake. I would guess around 15 minutes but I haven’t tried them myself yet. This looks so yummy. Do you have any suggestions for how to make it gluten and sugar free? A gazillion years ago, I was introduced to lemon-poppy seed bread as the perfect Mardi Gras treat, and have loved it ever since. While those holidays are no longer a part of my repertoire, I’ve missed it, as well as it’s cousin almond-poppy seed muffins. Thank you for giving me another chance at enjoying it. Oh, this sounds delish! I’m going to make this today! Thank you!! Yay! I hope you love the recipe Katie. This is the perfect Easter bread! It totally screams spring!